The National Museum of Contemporary Art, Athens (EMST) in collaboration with UNHCR and the support of the European Commission’s department for European Civil Protection and Humanitarian Aid Operations (ECHO), presented in winter 2017-2018 at the Museum in Athens, the interactive art project Face Forward …into my home. Following its warm reception in Athens, the project is now hosted in Crete, from 14 September to 14 October 2018, in the framework of the Municipality of Heraklion Festival “Crete, one history, 5+1 civilisations”, and is also expanded with the participation of refugees who reside on the island. Face Forward …into my home focuses on the stories of people who have been forced to leave their homelands and are rebuilding their life in Greece. It includes storytelling workshops inspired by a selection of contemporary artworks from the collection of the EMST, the photo shooting of portraits, and an exhibition with photo portraits and recorded personal stories of refugees and asylum-seekers, who are now living in Greece and benefitting from ESTIA, the Emergency Support To Integration and Accommodation programme implemented by UNHCR, the UN Refugee Agency, and funded by ECHO. 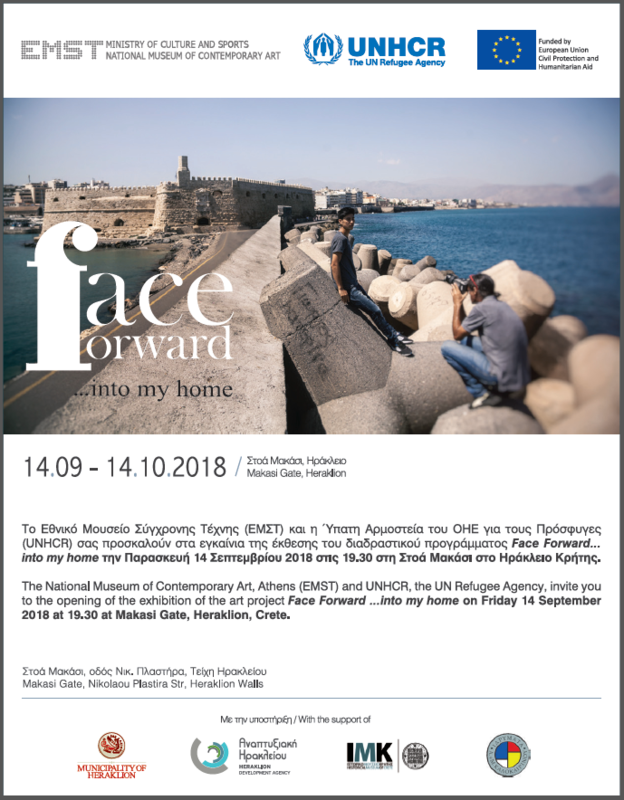 Face Forward …into my home was designed and implemented by EMST’s Education Department, in collaboration with UNHCR, and is funded by the European Commission’s department for European Civil Protection and Humanitarian Aid Operations (ECHO), in the framework of the ESTIA programme. ESTIA, which is implemented in collaboration with the Greek Government, local authorities and NGOs, provides urban accommodation and cash assistance to thousands of asylum seekers and refugees in Greece. On the island of Crete, ESTIA is implemented in collaboration with the Municipalities of Heraklion, Siteia and Chania, through the Development Agency of Heraklion. The personal narratives and photographic portraits will be presented at Makasi Gate, Heraklion, from 14 September to 14 October 2018. The works from the EMST collection that prompted the narratives will be also presented in digital form in the exhibition space, in addition to a short documentary video of the whole project. As part of the exhibition, educational programmes for students of all ages will be organized in cooperation with the Society of Cretan Historical Studies/Historical Museum of Crete, as well as parallel events in cooperation with the Social Space, A. & M. Kalokerinos Foundation, and the Development Agency of Heraklion. The National Museum of Contemporary Art, Athens (EMST) is a major contemporary art institution in Greece that from the beginning of its operation (2000) has developed a wide variety of programmes and activities addressing different audiences. The permanent home of the Museum is the former Fix brewery on Syngrou Ave., which was reconstructed to open its doors again in late 2016 with the first exhibition “Urgent Conversations: Athens – Antwerp” inaugurating the temporary exhibition spaces of EMST simultaneously with the series “EMST in the World” and attracting thousands of visitors. From April to July 2017 EMST was the main venue of the acclaimed art exhibition documenta 14, which was organized for the first time in two cities, Athens and Kassel, and attracted global attention. From June to September 2017, the exhibition “ANTIDORON. The EMST Collection” occupied Fridericianum, the emblematic building of documenta in Kassel, where more than 220 works of the Museum’s collection were presented. The European Union with its Member States is a leading global donor of humanitarian aid. Through the European Commission’s Civil Protection and Humanitarian Aid department (ECHO), the EU helps over 120 million victims of conflicts and disasters every year. With headquarters in Brussels and a global network of field offices, ECHO provides assistance to the most vulnerable people solely on the basis of humanitarian needs, without discrimination of race, ethnic group, religion, gender, age, nationality or political affiliation.